© 2012 Whitney Zed. All rights reserved. 28 Sep Post by Whitney Zed Filed under Most Popular Hairstyles in History. Tagged classic, Harper's Bazaar, Hollywood glam, Lauren Bacall, side part, waves. 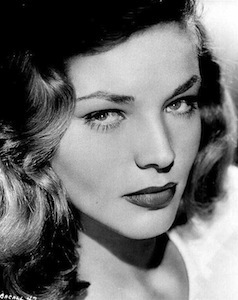 Lauren Bacall, best known for her deep, husky voice, was also an icon for her sultry looks on the silver screen. Portraying various roles from film noir to comedy to musicals, Lauren’s image on the screen and stage immortalized her signature hairstyle. She first caught the public’s eye through her cover on Harper’s Bazaar 1943, thank to her arresting image. Unlike the typical models of the 1940s who flaunted curvaceous figures, Lauren Bacall was a more slender type, and her face in the cover exhibited a strong sense of identity, which seemed to look straight back to the reader. The hairstyle for Lauren’s inaugural character was a deep side part, with face-framing waves – ironically, the same look from the Harper’s Bazaar cover that had her first noticed. She introduced the style with her role as leading lady with Humphrey Bogart in To Have And Have Not. Lauren’s hairstyle suited her so well that it was the iconic style given for her future characters, making the look legendary to this day. Coupled with her instant stardom bedroom eyes, which was a result of keeping her head down with nervousness, she also developed her classic gaze called “The Look”. Lauren Bacall embodied the style of true Hollywood glam through her bountiful mane, making her look timeless, elegant with a touch of seductiveness. She continues to garner flattery through imitation today, inspiring actress Sophia Bush for the cover of Genlux Magazine and runway looks by Christian Dior.